If your clients are exceptionally hard on themselves - believing that they need to please everyone (except themselves), and be the best in everything then this could the result of programming over the years from people who have influenced their lives in some way. The trouble is, most of us want to be the best that we can be but unless we accept our limitations we are likely to drive ourselves crazy in the attempt to live up to the expectations which have now been accepted as our own. 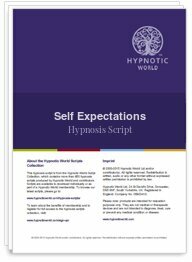 This Self Expectations hypnosis script from Hypnotic World aims to help your client to re-evaluate their self expectations and reduce their stress levels.